Let me clarify in the beginning itself, the movie is a disaster.After all 3 D gimmicks and many more publicity stunts, the film is nothing more than a headache. 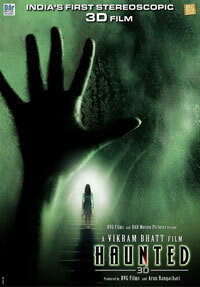 Performances are wooden.Story and screenplay (the only good thing) is adapted from the English movie 'The Entity'. Yes there are some good shots as well.Like the one in which a dead caretaker character wreaks much havoc like leaping out of a forest to attack the protagonists, and walking sideways down a tree to scare them.But rather than that, horror looks like the slapstick comedy. 3D effect is observant in some scenes only and so there was no need to make it in 3D! The otherwise good songs creates an irritation in the movie.You dont expect some dance sequence before the climax scene of the movie. In short, the movie may woe masala movie goer, but its a strict no from me. As said earlier, wooden performances.Tia (or Twinkle or whatever) is a little better than Mimoh (or Mahakshay or whatever). Story is adapted and screenplay is quirky so no comments. Editing is amateur.Movie is a hell long experience.Cinematography is good.Some sequences are shot well of course. Music is a hindrance to the movie.Background score is okay. Let me say that the direction is poor. You cant stop yourself from laughing out sometimes at bad dialouges and predictable story.This one is not even par with Bhatt standards. The movie is a one time watch in 3D and strictly avoidable in 2D. The movie was alright. watched it with 7 other people in the ages from 8 to 33. all of them enjoyed the movie and got scared several times. the girl was hot (all u need in a scary movie) and mithun C son acted good to. the music was insane in this movie, and i rate its album as one of the best ever from indian cinema.